Just how much does the Trump administration want to cut Medicaid? No one -- including the White House -- is really sure. $600 billion? $800 billion? Or a stunning $1.4 trillion over the next decade? 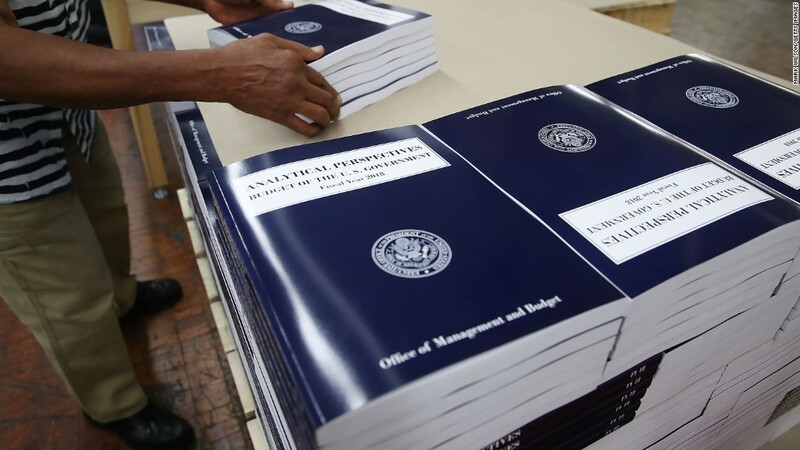 "It's north of $610 billion, but it's not $1.4 trillion," according to a senior official from the White House Office of Management and Budget. CNNMoney has spent the past two days trying to figure out exactly how much President Trump wants to carve out of Medicaid, which covers more than 70 million low-income children, adults, senior citizens and disabled Americans. Medicaid has long been a target of Republicans. They call for slashing the program in both the health care bill that passed the House earlier this month and the president's budget released this week. While Congress isn't expected to adopt Trump's wish list, the budget does provide insights into how the administration would overhaul Medicaid -- a program the president once promised he wouldn't touch. Here's why it's tough to know how big Trump's Medicaid cuts are. The White House's budget summary tables show that reforming Medicaid would save $610 billion over the next 10 years. That's done mainly by turning it into either a block grant, which would give states a fixed level of funds, or a per capita program, which would send states a set amount of money based on enrollment. Either one could greatly reduce federal support. The GOP health care bill would also make those changes, but the Trump budget would go even further, according to White House Budget Director Mick Mulvaney. The Republican bill also opts for a slower rate of spending growth than Republicans include in their legislation to repeal major portions of Obamacare. The White House budget, however, doesn't clearly state the spending impact of this assumption on Medicaid. It contains only an opaque reference on line 666, titled "allowance for Obamacare repeal and replacement," which reduces spending by $1.25 trillion over the next 10 years. This stems not only from the bill's Medicaid changes, but also the restructuring or elimination of various Obamacare subsidies and possibly other items. Plus, part of the Medicaid cuts in the House bill comes from converting Medicaid into a block grant or per capita program. But that shift is already included in the estimated $610 billion in Medicaid reform savings in the White House budget. Mulvaney told lawmakers on Wednesday that the reduction in Medicaid spending from the president's budget and the House bill can't be added together because they "contain some of the same factors." Bottom line: We don't know how much the Trump budget would cut from Medicaid. The confusion has left many health care and budget experts across the political spectrum guessing at the figure. Many say it looks like the White House would combine its Medicaid spending cuts ($610 billion) with the House bill's reduction ($839 billion) for a total of around $1.4 trillion. This would equal nearly half of the program's budget in 10 years. "Ultimately, Medicaid would face a nearly 50 percent cut in the year 2027 relative to current law," the Concord Coalition, a deficit watchdog group, said Tuesday. The conservative Heritage Foundation and the liberal Center on Budget and Policy Priorities agreed Tuesday that the spending reductions appeared to be additive. Cuts of this size would have a devastating impact on Medicaid, said Robert Greenstein, the center's president. "Under the budget, states would face even deeper Medicaid cost-shifts and feel compelled to impose further cuts to Medicaid benefits and eligibility in order to cope with the diminished federal Medicaid funding they would receive," he said.